If you haven’t read Soul Work by Randy Harris you’re missing out. 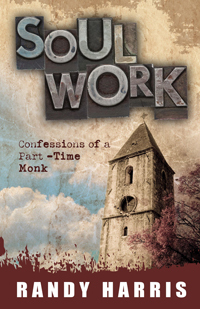 It’s Harris’ sequel to the first volume God Work. Jesus is a friend to Randy. When he writes, I read. When he speaks at Abilene or Tulsa or wherever, I listen. I promise I’ve stolen so much from Randy’s ministry that I’ve incorporated into my own he could probably sue me…. Jesus is Randy’s friend. And it’s evident in his life’s work. Put me to what you will, rank me with whom you will. Let me be employed for you or laid aside by you. And now, O gracious and blessed God. You are mine, and I am yours. So be it. And the covenant which I have made on earth, let it be ratified in heaven. May we be so bold as to pray such prayers! I love that prayer. I got a copy from Randy at Summit in 2010 and have it on my bathroom mirror to read often. Powerful words.